This mod is currently incompatible with Hopper Ducts. 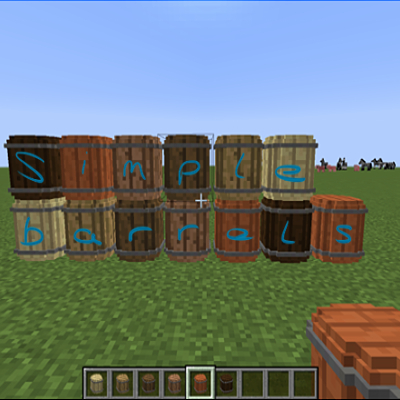 Simple Barrels uses the new Capability System, Hopper Ducts uses the old inventory system. They are incompatible. This mod adds simple to craft barrels to minecraft that can store up to 4096 items or blocks of a single type in them. Latest version now works with Hoppers and any Mod that supports the new Forge Capabilities system. Wood can be of any vanilla type. oak will make oak barrel, spruce will make spruce. etc. You can now craft this without the item frame or comparator. The item Frame lets you see whats inside the barrel, the comparator allows the count to be displayed on the side of the barrel. Later on you can add these items to the barrel with the upgrades, just put 4 sticks around the item frame or comparator to get the upgrade and then shift click the barrel with the item. ***NEW*** Now Supports Forestry planks in the recipe! Can you check my showcase and put it in your post?! 1.25f will spawn extra item entities when a barrel is broken in creative mode, but they're just ghost items, can't actually be picked up, etc. Barrels that aren't cubes? This is the new age of modding right here. SimpleBarrels 1.25 crashes on server loading. Your Mod is Licensed under All Rights Reserved and I am working on a 1.10.2 pack and would like to use your mod, as such, may I? Personally, I love these as an alternate mass storage option for modpacks that are more RP/RPG oriented or that don't use RF/Tesla power- we don't have a whole lot of options for mass storage, and I think this is a really cool alternative. The fact that they actually LOOK like barrels is absolutely awesome (that was something that always confused/flustered me with other 'barrel' mods)! Totally following this and putting it on my list of mods for when I update my RPG modpack to 1.9/1.10 ^_^! The standard to live up to is the barrel from Neotech, which displays the item and its quantity, can be upgraded well beyond a "mere" 64 stacks (which is not always the same thing as 4096 items) and can also be upgraded to act as a cobble generator. On the other hand, yours... looks like barrels. on the contrary, my barrels hold 4096 items. not 64 stacks, there's some jiggery pokery going on in the background that means in theroy you could hold billions of items with as yet undefined upgrades. Upgrades WILL be a feature at some point, i wanted to get the mod out for 1.9.4/1.10 asap. The Cobble Generator isnt a horrible idea, however, these are wooden barrels so maybe i'll have to think of a suitable material. Eventually you wont have to use the comparator early game as showing the number of items will be an optional upgrade, same with showing the contents of the barrel. We cant always have the materials for an item frame or comparator. You will have to also bear in mind that as with all my mods, I aim for balance. They each have their place. These have a more vanilla-feel and I dig it. I'm not sure why you decided to praise a different mod in the comment section of another mod, but it's in bad taste. If you'd like to request x feature, then by all means go for it, but this condescending attitude has no place here. I hope someone gives you a hug. I said it was a start. I am simply pointing out, in my own roundabout way, that this mod has much potential. But I can't ignore the progress made by other mods with similar features. Far too often mods come out which end up being garbage because someone wanted to stick with an ineffective design idea. I also point out Neotech is not on 1.10 yet, and may be discontinued, which is a good thing for Simple Barrels. However, you will get people much more impatient than I, who will now be asking for all the Neotech features (even the not simple, not related to barrels ones), and I thought to bring you up to speed on them.